Figure 1: Sequence alignment of the library member luxR variants. BBa_K1216008: part of a PLuxR collection of promoters with differing AHL sensitivity. 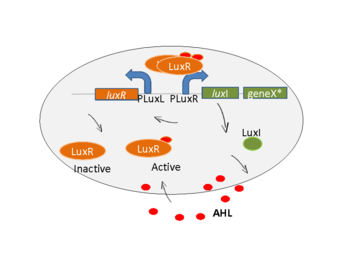 This significantly increases usefulness of the Lux signaling system, as differential respones to cell concentrations are enabled. Further they can even be used to detect geometrical settings of colonies. After obtaining a less sensitive variant of PLuxR we used it as a starting point for further engineering of mutant promoters. This approach ultimately lead to a library of promoters spanning a reasonably big range of EC50 values. Please see details in the characterization section below. Figure 3: Dose response curve experiment plates of the promoter library with an RFP reporter. On the picture you can see 11 plates presenting different AHL concentrations in the agar( 10^-5 nM, 10^-4 nM, 10^-3 nM,10^-2 nM,10^-1 nM,10^0 nM,10^1 nM,10^2 nM,10^3 nM,10^4 nM,10^5 nM) of the backmutations SM1, SM2, SM3, SM4, SM5, SM6 and DM. (SM = Single mutation, DM = Double mutation. As explained above we created a library of promoters originating from PLuxR variant Bba_K1216007. 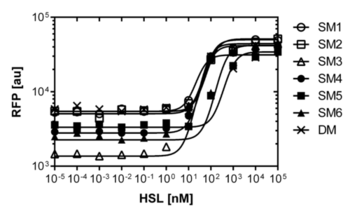 We characterized the dose response curve to AHL on agar plates of all 7 promoters by following the same protocol as for the PLuxR variant Bba_K1216007 characterization. See the different shifted dose response curves in Figure 4 and the characteristics of the library in Table 1. Figure 4: Dose response curve of the promoter library. 7 different promoter were created by partial sensitivity recovery of the PLuxR variant. The colonies have the PLac-LuxR-PLuxR BBa_J09855 construct with the different mutated promoter as well as a RFP reporter to analyze the dose response in the flow cytometer. The colonies were grown on plates with 11 different concentrations of AHL as explained in Figure 9. Please see table 1 for the characteristics of the promoter library. Figure 11. Comparison of a chosen set of promoters. The wild-type, PLuxR variant (Bba_K1216007, and the mutants created by rational design and partial sensitivity recovery SM1 and SM5. 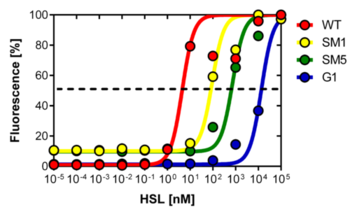 Figure 10. shows the relative fluorescence over the [AHL] of the dose-response curves of the whole library except for the Bba_K1216007 and the wild type PLuxR promoter. 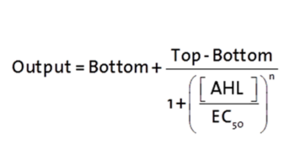 Figure 11. is a comparison of a chosen set of promising promoters, which we tried in different constructs for the final gameplay according to the prediction of our mathematical model.